It’s a gas, gas, gas. After the furore over the future of the Longannet power station, where the coal-fired generator has to pay £40 million per annum just to connect to the grid, I decided to do a bit more digging into the energy sector of the UK. What I found doesn’t surprise me but it does sadden me. For here we are living in a land rich in natural resources. We have an abundance of energy sources yet we pay the highest prices for our energy in the whole UK. Which is bizarre when you consider that we produce so much of the stuff. I happened upon a report from Consumer Focus which caught my eye. It is entitled, “Off-gas consumers” and it details the numbers of people who are connected to the mains gas grid in the UK. But before we get into the report it is worth reminding ourselves where the UK’s natural gas comes from, for this we can get the information from the DECC in their DUKES report. Reading through the DUKES report we can see that the UK is no longer self-sufficient in natural gas, we produce around 50% of what we consume. The rest is imported and the bulk of that comes through the Langeled interconnection from Norway. But if we look at the home produced stuff we can see that the vast majority of it comes from the North Sea. There is an area off East Anglia which produces a lot of gas and very little oil but all of the rest comes from Scottish waters and it is landed at St. Fergus gas terminal near the Broch. Just up the road from me. 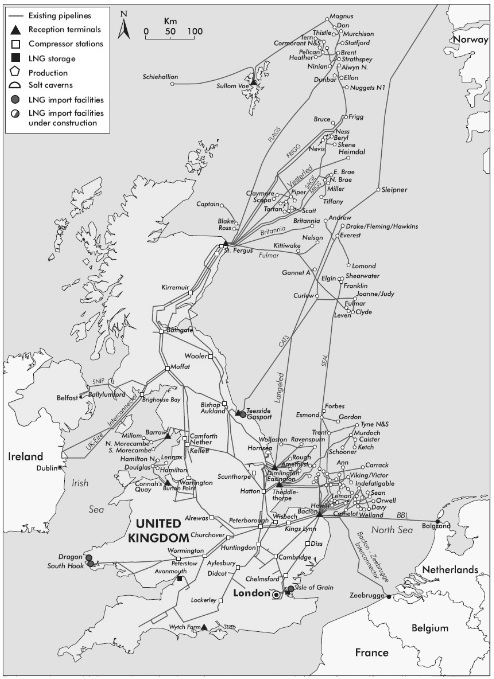 From there the gas enters the UK’s gas transmission system and travels through 4 pipelines which transport the gas south, all the way south. All of those pipelines pass close to my house, one of them is less than 400m away, yet I have no mains gas. Although the table states 2009 prices it was updated in 2013, but since the fall in the price of oil we can assume that the figures are no longer valid. However the point of the table is to illustrate the costs of each fuel for heating our homes. As we can see, mains gas is the cheapest and electric heating can be almost three times more expensive. Here in Gordon I use heating oil and logs. Cheapish but not as cheap as mains gas. But I’m not alone in the lack of mains gas, there are others. We can see that in England 92.8% of households have access to mains gas. But the picture here in Scotland is not so rosy, up here we only have 86.4% of our households with access to mains gas. Of those without mains gas access 15.2% of the households use the most expensive fuel type, electricity. As the Consumer Focus report describes, a lack of access to mains gas creates fuel poverty. So how can it be that we produce so much natural gas yet we have so small a distribution network? Part of the answer is that we have a larger rural population scattered over a larger area than England, but that’s not all of the answer. Methlick is a village not far from me and it has a population of 442 at the last census, yet it has no mains gas. There are countless other small villages dotted about the countryside which are also deficient of a mains gas supply. So who or what is responsible? The distribution of mains gas in Scotland is controlled by a single company which is now called SGN, some might call that a monopoly. SGN is owned by three shareholders: Borealis Infrastructure Europe (UK) Ltd (25%), Ontario Teachers Pension Plan Board (25%) and Scottish and Southern Energy (SSE) Ltd (50%). 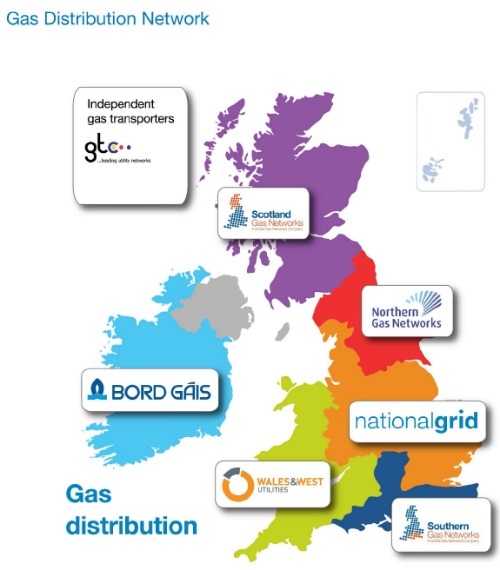 SGN also distribute gas in southern England. SSE has some directors on SGN’s board. SSE also produce electricity, and as we have seen we have the most expensive electricity in the country. We can see from the above that the electricity is more expensive in Scotland but the gas price is exactly the same. We discussed the extra cost that Scotland pays for electricity in this post. The normal reason given is that we are so remote from the generators that the transmission costs are higher, also our generators pay more to connect to the national grid because they are remote from the main population centres (hence the £40 million connection charge for Longannet). By the same logic surely we should see the same thing for gas: the further away from the supply you are the more you would pay since there are losses in the gas network also? However this is not the case. A customer in London can buy gas from the Scottish sector of the North Sea for the same price that a customer who lives right next door to where that gas comes ashore pays. What kind of twisted logic is this? Is this a case of Scotland subsidising the rest of UK again? But that is not all, lets take a look at where some of this gas ends up; power stations. The most efficient, and cleanest, form of power generation from fossil fuels is currently the Combined Cycle Gas Turbine power station. With such an abundance of gas you expect that Scotland would have a few of these? Eh no, we have one at Peterhead and the old Cockenzie coal-fired station is due for conversion at some point. So if we don’t have them who does? Well if we have a look at this list from Wikipedia we can see that England has 45 of them, all of them being built since 1991. Coincidentally this is just after the privatisation of British Gas in 1986. Perhaps that explains why there are no extra transmission costs for gas? Or am I just being overly cynical? Longannet is back in the news today with the announcement that it may have to close next year due to the high connection charges. The UK government, who have energy as a reserved matter, say that they will look at the pricing structure for electricity transmission in 2016. They also say that Scotland’s energy supply is assured due to the pooling and sharing of resources and all those lovely CCGT power stations daan saarf will keep the lights on. The problem is that we will have to pay more for this electricity, which is produced from Scottish gas in England, to be sent from England back to Scotland, due to transmissionlosses. Logical it is not. Is this a case of the UK government deliberately running the Scottish industries and infrastructure down in order for us to be more dependant upon rUK and therefore less likely to become independent? Therein lies the question. This entry was posted in Scotland, Uncategorised and tagged CCGT, electricity, gas, Longannet, North Sea, power generation, power stations on 25th February 2015 by the45.